Here are three reasons to love papaya and include it in your diet. Papaya’s contain soft and easy to digest flesh with a high amount of soluble fibre. That’s the type of fibre that helps to regulate normal bowel movements and prevent constipation. 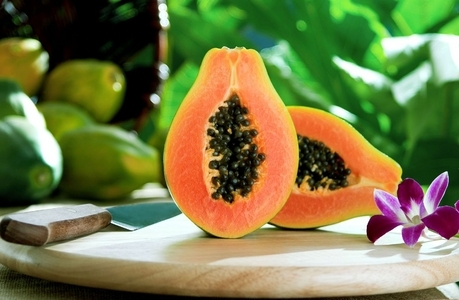 Papaya also contains a high concentration of papain a proteolytic enzyme that helps to digest and breakdown proteins. Papaya contains a high concentration of Vitamin A (1094IU/100g) and flavonoids such as B-carotene, lutein, zeaxanthin and cryptoxanthin. These compounds are known for their antioxidant properties scavenging free radicals and playing a key roll in aging and various disease processes. In particular studies have shown that zeaxanthin can help to slow down and even prevent the development of Age-related macular degeneration. With a high concentration of papain and Vitamin A papaya helps to remove dead skin cells and breakdown inactive proteins. Grind some fresh papaya to a fine paste and apply to your face for approximately 25 minutes to reduce blemishes and unwanted skin pimples. Eating the fresh fruit on a regular basis can also help with skin hydration due to its low sodium content helping you to achieve smooth, supple and soft skin. You’ve got very good info in this article…….